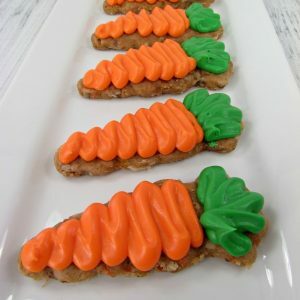 With the use of a boxed cake mix, these Carrot Cake Cookies are so easy to make. Topped with homemade cream cheese frosting, they're hard to resist! Mix the carrot cake mix, the oil, and the eggs. Add the rest of the ingredients including the flour and mix. Divide your dough into thirds and wrap in plastic wrap. Place it in the refrigerator for about an hour. Once your dough is cold, unwrap it and save the plastic wrap. Sprinkle a clean surface (counter or plastic cutting board) and the dough with a little bit of flour. Then, place the plastic wrap on top of the dough and roll it out to 1/4″ thick. Place the rolled dough into the freezer for at least an hour. Preheat oven to 350 degrees. Bake on a baking sheet covered with parchment paper for about 12-14 minutes. Cool completely before you decorate them. Mix the butter and cream cheese together in a stand mixer (or using a hand mixer). Add vanilla and powdered sugar and mix until combined. Lastly, mix in heavy whipping cream. Add more cream or more powdered sugar to reach desired consistency. Keep it stored in the fridge when not in use.